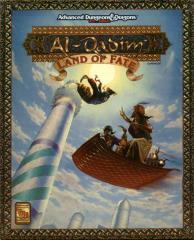 Ride a magic carpet to the land of a thousand and one adventures! Visit spired cities, lush oases, and mysterious isles set in glittering seas. Meet sultans and sheikhs. See genies and giants. Discover a trove of new magical treasures! Whether your character starts from the compatible FORGOTTEN REALMS game setting or begins the journey elsewhere, this box contains everything a bold adventurer needs to explore the exotic AL-QADIM campaign world.